I'm very happy to report that I'm on a productive roll. My flower heads are just falling into place. This is all down to much preparation beforehand. It's really paying off now. After the template markings and allocating the light and dark shading, there's just a few minutes of fabric selection needed before I start cutting away and turn edge applique-ing all the flowers. The first bloom I made, with the moody purple batik background, has really set the tone with a splash of yellows that are going to be repeated in the lillies and some purple hues - but brighter- which will happen in the lower flowers. I'll have a splash of pink in there too and of course, my rosebuds will be classically red or fuchsia, depending on how dark / shady the bouquet looks overall. 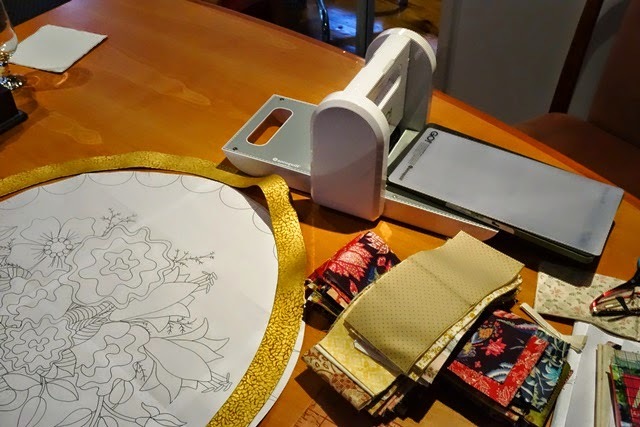 Here I've lined up my fusible on various fabrics. 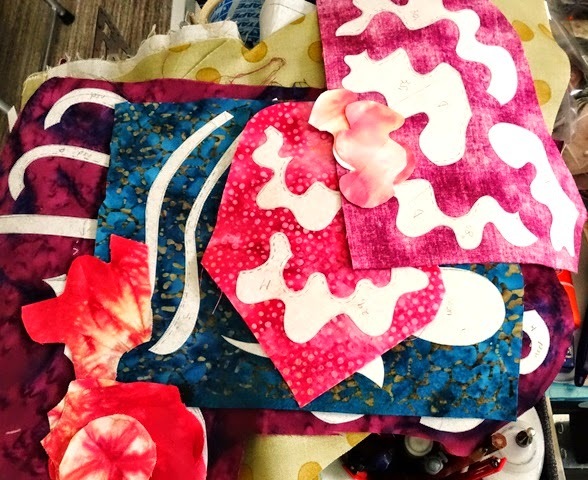 because I always make repetitions for my flower applique stash, there may be duplicates here, so don't try to count them! It's my pattern, but even I need to properly prep beforehand. I know it can be repetitive, but it's the best use of your time and resources. I can't wait to show you my bouquet! After much umming and ahhhing I decided that the batik fabric belongs behind the bloom head. So I remade the bloom with a bright mid yellow and I think it looks great now. Sometimes it takes a bit of playing around to find the look you know is waiting for you. Because my blooms have a habit of growing, I'm keeping strictly to the pattern and checking it up against the template and background. Everything fits beautifully and its time to move on to the lily. What do you think of my leaves? I have fussy cut them from an old stash piece and the stroke work looks just like painted leaves. I love it, its a great touch. I just had to make a quick post to celebrate the fact that my Yahoo BOM Group now has over 5,000 members! The very first pattern I ever released was Red Delicious. I still LOVE that quilt. And I love knowing that there are hundreds of Red Delicious quilts out there. A few years ago, I was sent images from a 'Red Delicious' show that took place here in Australia and another over in the US. 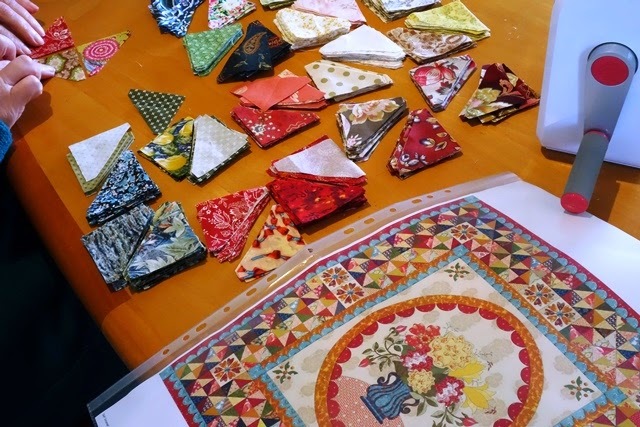 That really made my day and it's really what we're all about - making quilts! 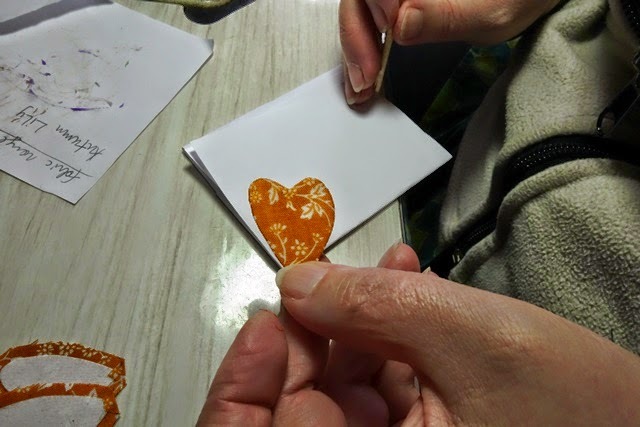 We're more than just a quilting Group, we're a friendship Group as well, and I love seeing members from all over the world comment and and share images of their quilts, it's such a blessing to share in the pleasure of quilting with others from all walks of life. If you're a member, thank you for being part of my Yahoo BOM Group, I'm so glad you are. A huge thank you to our Moderators who keep our Group spam and nuisance free as well as providing endless advice, tips, suggestions and encouragement. 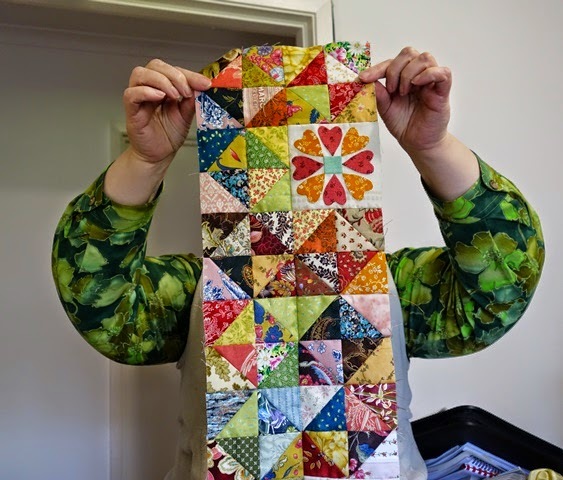 We're so blessed to have moderators who are also skilled quilters as well as being Yahoo Group savvy. And I really mean that, because without Moderators there would be no Group, I simply couldn't do it without them and simply wouldn't. Thanks to our current moderators: Anne Marieke, Bunny, Pat and Glenda for being such a great team. And many thanks also to Jane who was such an important member of our moderating team for a while too. Of course, Moderators have busy lives like the rest of us and I'm grateful for the time they do or have spent making our Group work. It's a sacrifice and commitment I know we're all grateful for. Thank you. 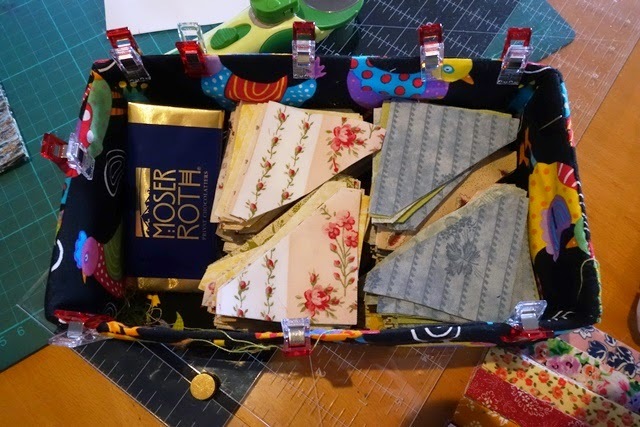 My Yahoo BOM Group is open to any quilter who wants to or is making any of my patterns. Members are asked to follow Group Rules to keep communication friendly, on topic and spam free. Each year I release my original patterns in the Group for free to members. Membership is free and joining is free. To celebrate 5000 members, I'm offering the Red Delicious & Cherry Thieves Table Runner patterns (my first free BOM patterns) at 50% off. Simply use coupon code "wow5000" in my shop at the checkout. All other patterns in my shop are 25% off this week only to allow members who missed out on any past free BOMs to buy any patterns they love at the best possible price. Simply use coupon code "wow25" at checkout to activate. Red Delicious was my first ever free BOM. I still love it today and would make it again in a heartbeat (if I had the time) in a new colour scheme. Luckily for me, many of you did make it and this means that I've enjoyed seeing it made in many hues. The Cherry Thieves Table Runner below goes with Red Delicious and was also released for free back in 2008. Time for some fun! 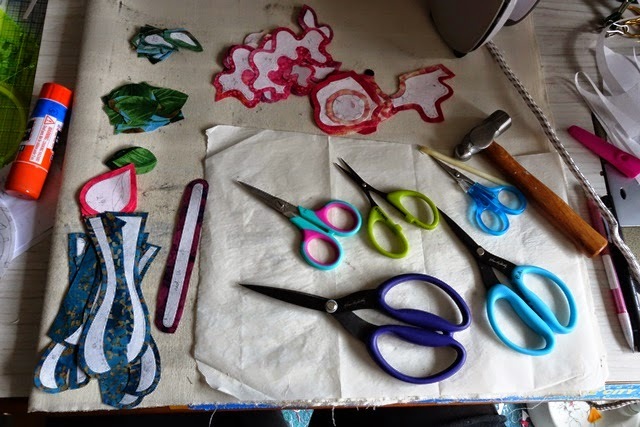 I think applique-ing flowers and bouquets is the best bit about Lily Rose, I'm really looking forward to getting creative with the centre and it all starts here, with the first bloom. 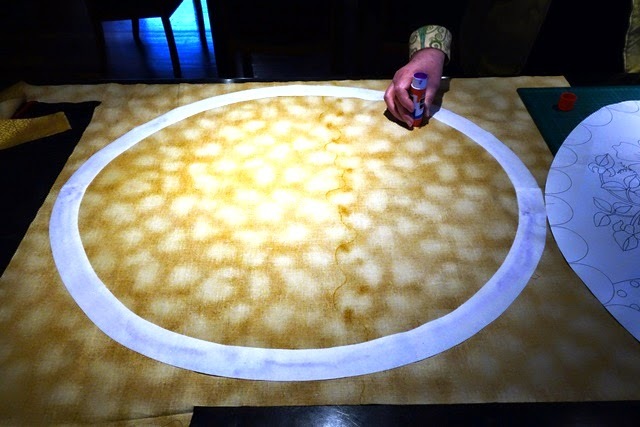 Now, I have measured my oval template against the pattern and I am certain that everything fits. Please take the time to do this and double check your accuracy. If your oval frame is a little bit out, you have an opportunity to resize or re-position the vase bouquet to make it all work. If you have mis calculated, making an adjustment is preferable to re-making the oval frame, so check everything twice. 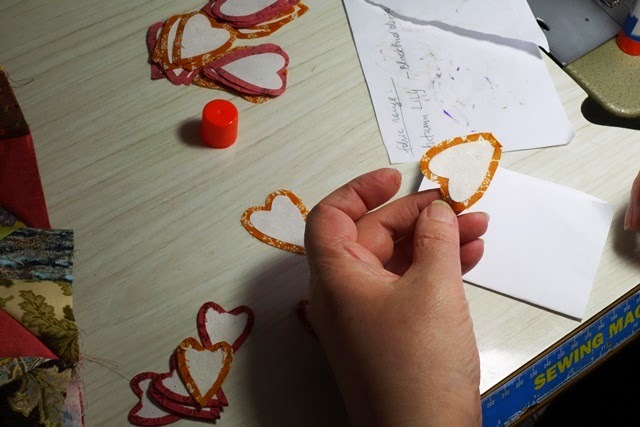 As you make your flowers, keep checking them against the pattern as they have a habit of growing when they are away from their intended background! 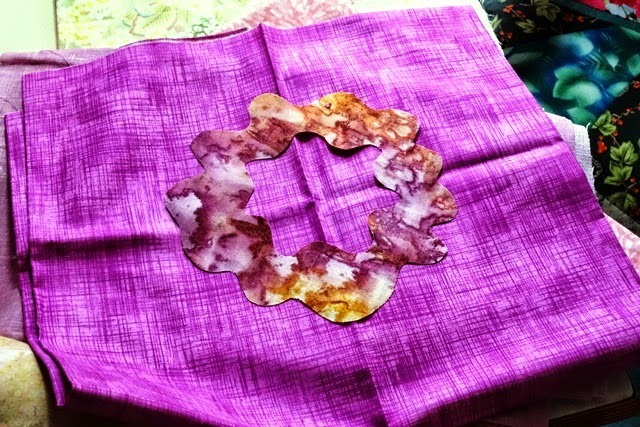 I am using wash away fusible again as my template and ironing it down onto this dyed fabric. I have specifically chosen it for the rich colours. I'm essentially fussy cutting to get a more orange yellow graduation through the flower. 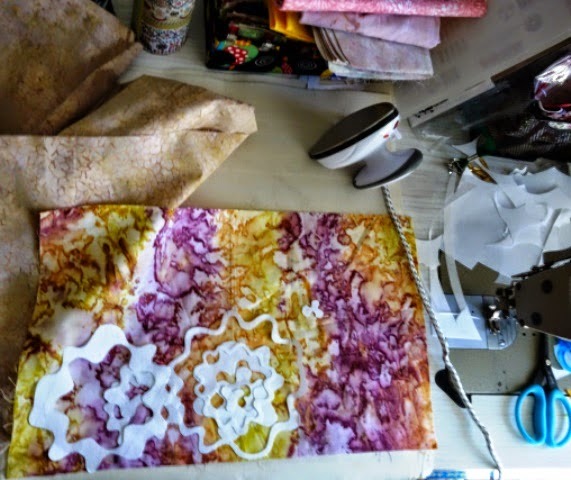 It looks like this: purple with some tinges of orange, gold and yellow.Now I just have to select the background of the bloom by changing what fabric will go beneath my batik bloom shape.This means auditioning several fabrics from my stash. I want the blooms to pop out but I also want them to harmonise with my patchy HSTs (that's why I created my HST border before starting the flowers). I'm beginning to think that maybe the fusible part of the bloom might be what's wrong, I think I will make several bloom and try auditioning those to see how I go. 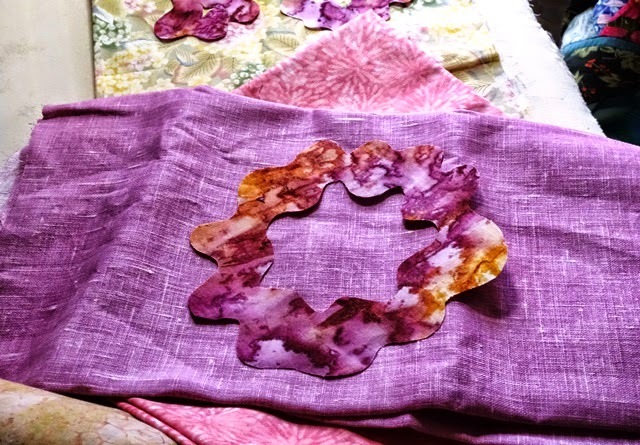 I really like the batik purple bloom, but there's something amiss with it at this stage. 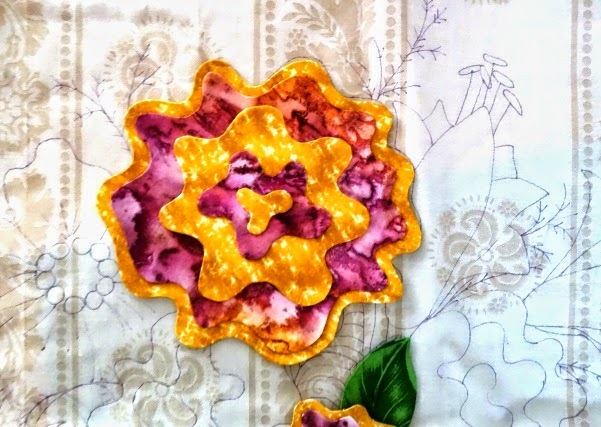 I often make extras of flowers and applique bits and pieces when creating my quilts. 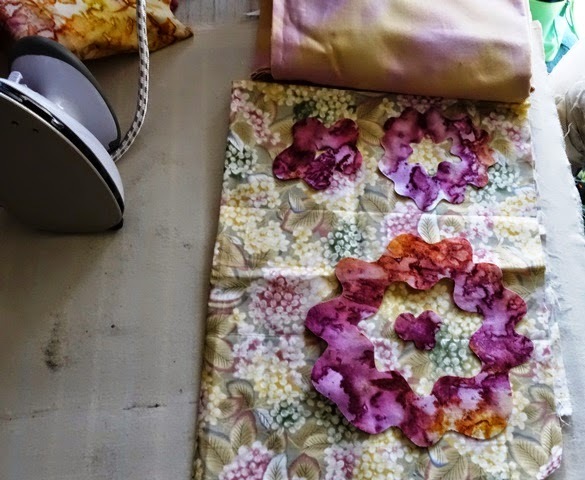 In fact I have a box of all these extra blooms and one day I will sew them all down on a single cloth dark background as a dramatic wall hanging. 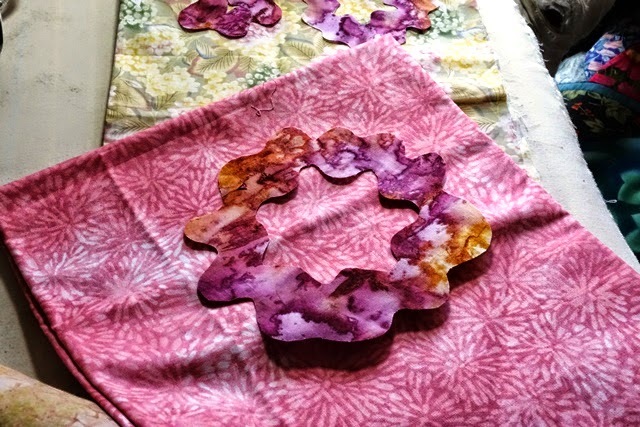 So I really don't mind making the extra, I'm just surprised that I have to this time as I had such a clear impression that I was going to make a bloom with the batik. I decided to do all my hearts at once. Of course, I did opt for the heart blocks in the Lily Rose border which are optional. 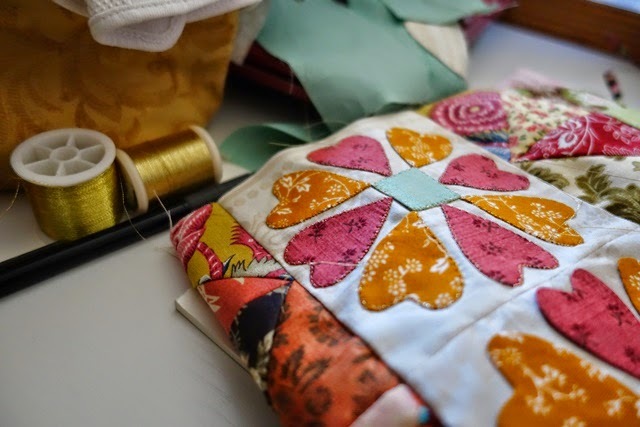 I think these blocks really add something special to the quilt and I have a real soft spot for them. 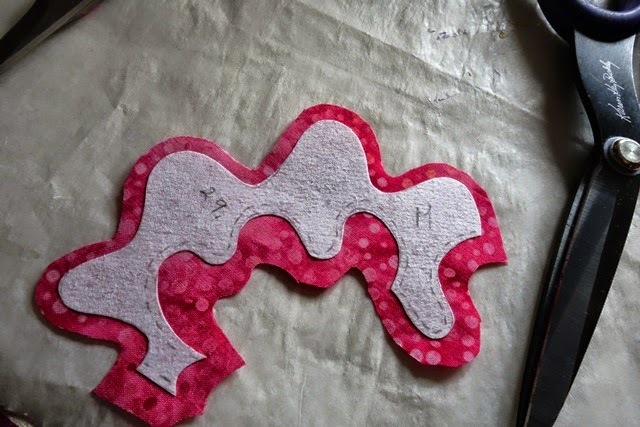 It's just a simple method of tracing out my hearts onto wash away fusible, ironing it down my chosen fabric, cutting it out with a small seam, and then gluing the edge fabric with Elmer's disappearing purple glue and turning the edges over with a small cuticle stick, keeping the whole shape smooth. 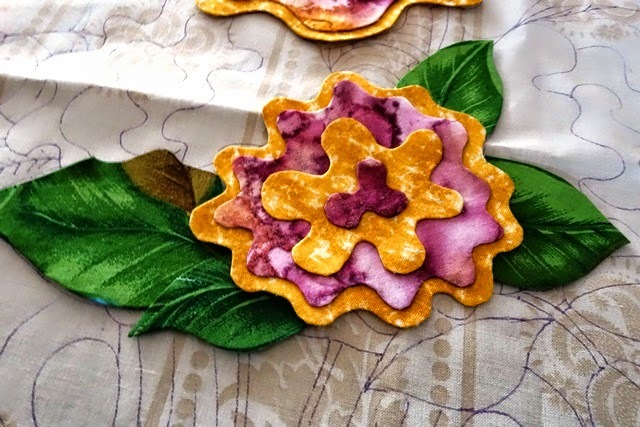 You can also create this process with freezer paper using my freezer paper applique method (see my tutorial on the sidebar), but in that case you need to remove the freezer paper. 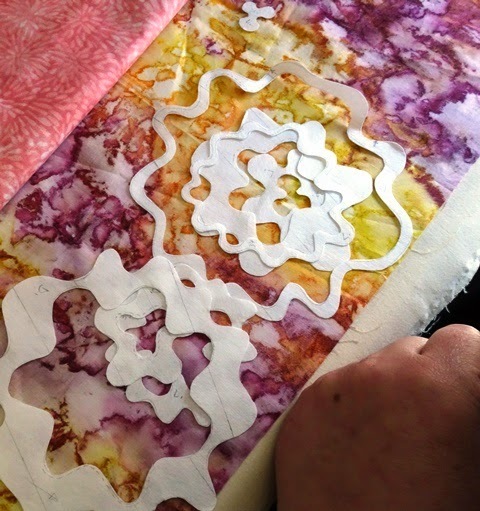 I'm very fond of the freezer paper technique, the reason I use wash away fusible is because I find it easier to work with in terms of speed. Also, I print out my pattern on a copier that prints the pattern directly into the fusible and this saves me time too. My Bernina 820 has been very bad today. I'm having ongoing trouble using anything but the plainest thread. 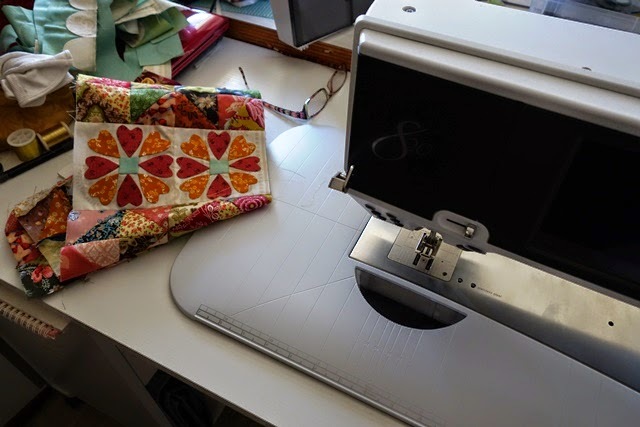 With this machine, thread, tension and stitch troubles are the three key issues with it. It's the same issue over and over. 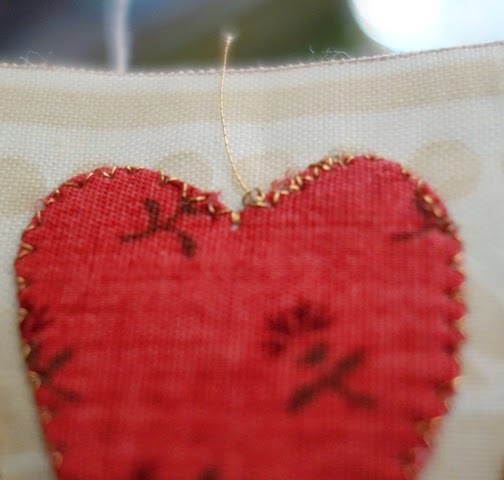 I am determined to have my gold stitched hearts, but its becoming more trouble than its worth. 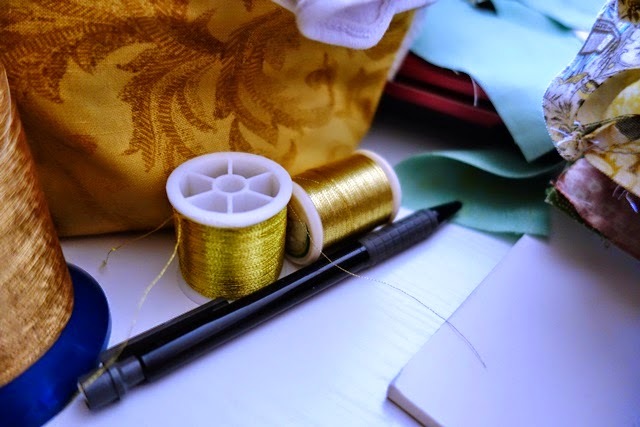 I have a lot of experience stitching in metallic thread so I go through my thread stash trying them all out until one is accepted by my temperamental machine. Once again, the simplest sewing endeavours become a struggle. I'm surprised anew at how badly my 820 is performing. It has a knack for turning what should be the simplest work into messy, unusable work. Thanks Bernina. I got ahead of myself when I thought the Bernina 820 could be used for a simple blanket stitch - it can't. I'll be changing my plans for the rest of the quilt now. Decorative stitches are out. I'm having one of those weeks. 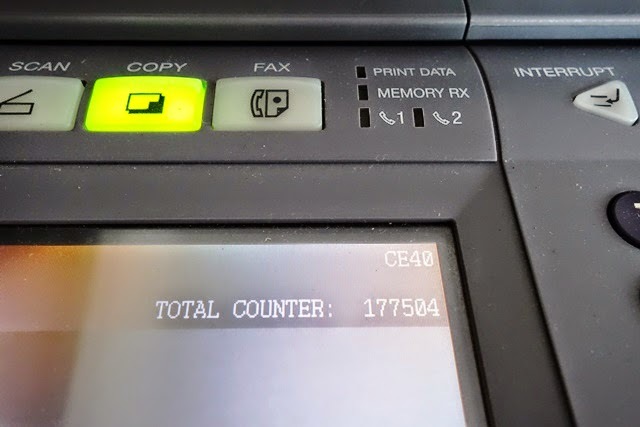 My copier has died with a tricky CE40 error code and being the one tool I most rely on, its totally thrown out my schedule for January. 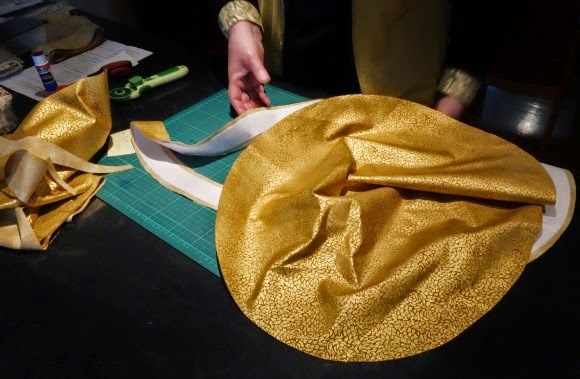 I'm really unhappy about it, however there's nothing I can do so I've decided to take my frustrations out with some repetitive sewing, that way something good will come from my January set back. Having three patterns sitting on my copier desk ready for scanning in just makes it worse. What else can I do but sew? I'm going to make the most of my computer downtime by getting behind my sewing machine. Seeing that I need to finish Lily Rose ASAP, it might even be auspicious. At least that's how I've decided to think about this pause to my BOMs progress and hopefully, if nothing else, I'll have Lily Rose up to date and perhaps even finished before February. Apart from two greens meeting up (how did that happen?) I'm really pleased with the balance of patchy fabrics making up my Lily Rose HSTs. Who would have thought such a simple border would cause me so much time and (over) thinking? The good news is that I really love this effect, it's so complimentary to the centre design. And now I can re-focus on my applique bouquet in the centre. 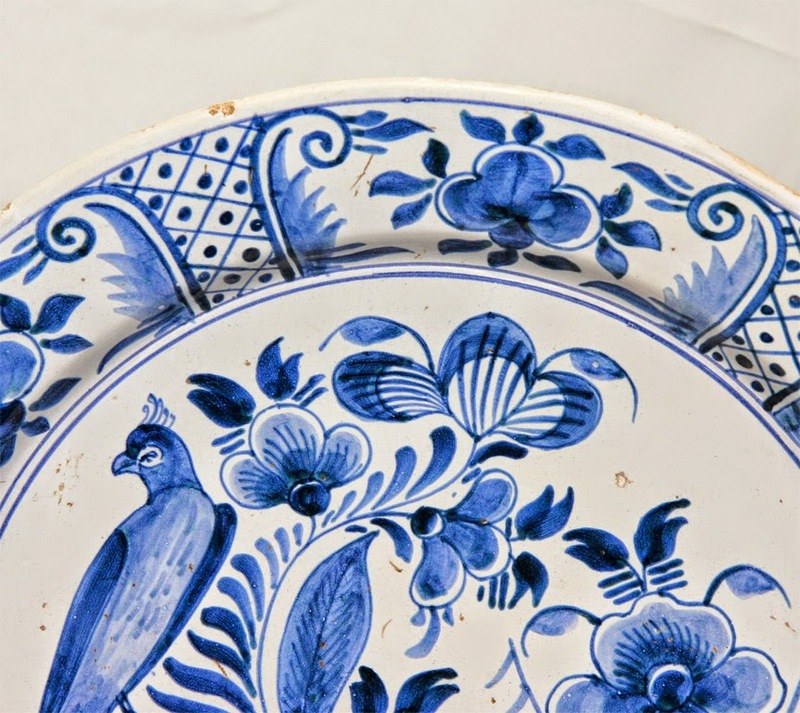 We're starting Oma's Blues with the central plate, "Oma's Plate'. This is a digital image of the design. As mentioned in the Introductory Post, I'm having trouble settling on the right blue to show this pattern off in its best light, but you get the idea. 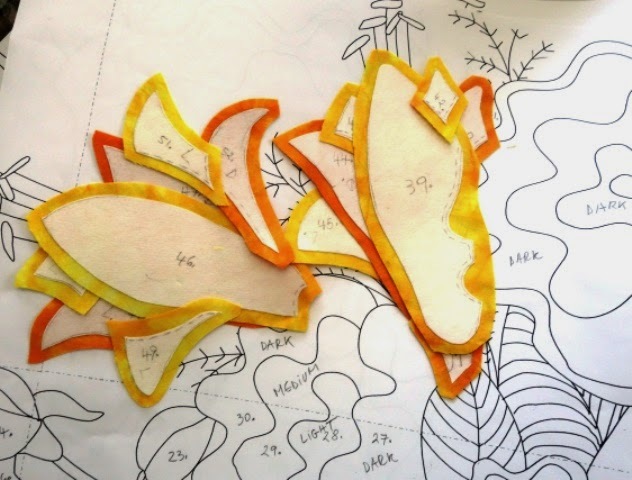 The pattern itself contains extra flourishes and lines to enhance the design - this image is of the pattern pre embellishments. 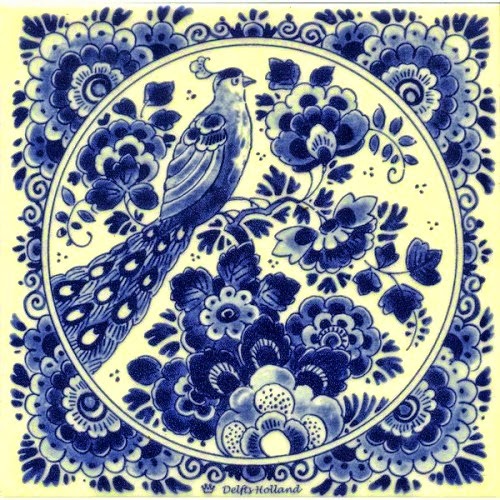 I just love everything about this plate and plan on making two - one for my quilt and one for a matching cushion. 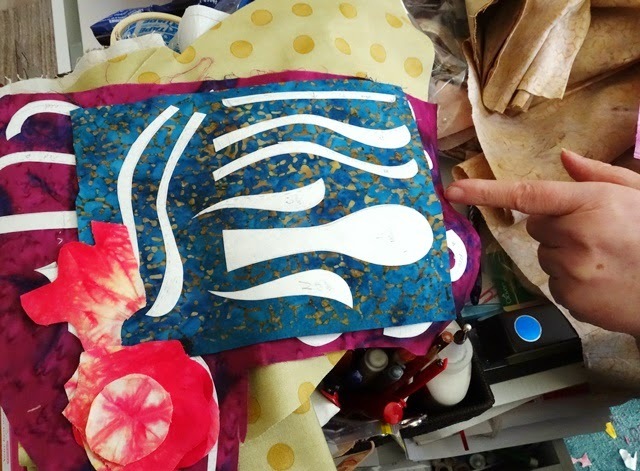 In this first part of the BOM, you receive the fabric requirements for the whole quilt and from the blue fabric allocation, you create the applique on a white background to complete this block. For those of you with beautiful blue fabrics in your stash, pull them out and search for any motifs suitable for broderie perse, this quilt is perfect for showing off fussy cutting and embellishments. Oma's Blues is a free BOM made available to members of my Yahoo BOM Group. Schedule: Jan - Nov 2015. New blocks released 15th of each month. Are you ready for a new BOM? I am! I've been in a Love Entwined cloud for the last 2 years and I'm ready to share some new quilts with you all. Whilst LE will continue to have a place in my heart forever, there's enough room now for me to dust off those quilts that have been waiting in the wings. I am hoping to release several this year. The first for the year is Oma's Blues. 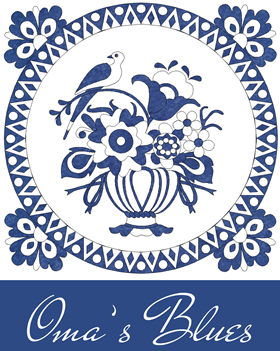 This is a quilt based on my love for blue and white tableware, specifically delftware plates. I've always wanted a quilt that somehow incorporated my love for dishware and plates - and now I have! What do you think? This quilt starts off with Oma's Plate - the central panel block which is the focus of the quilt. Surrounding Oma's Plate is a selection of smaller hanging charm plates and finally we have 'stacks' of plates all around the quilt. These are framed by ornamental plates in the top corners. In my minds eye, I'm imaging an old fashioned large kitchen with stone floors, an aga, shelves of plates and a wall beside a window for seating - and this quilt taking pride of place. I think it's important to give quilts an imaginary life when we're creating them and this one is especially vivid for me. Blocks are released on the 15th of each month. To take part and download the patterns each month, you must be a member of my Yahoo BOM Group. It's free to join my Group, you simply have to be willing to abide by our Group Rules. ‘Oma’ is the German word for Grandmother and is also used throughout Northern Europe. When I was child, my own Oma would task me with the seasonal chore of carefully dusting and wiping down her blue tableware and fine china. I can still remember gazing into the rich motifs of florals, animals and flourishes—some naïve, some highly decorative. It’s a memory that’s stayed with me all my life. In Oma’s Blues, I’ve recreated a series of designs as a tribute to my own childhood and the charming blue drawings that captivated my imagination. 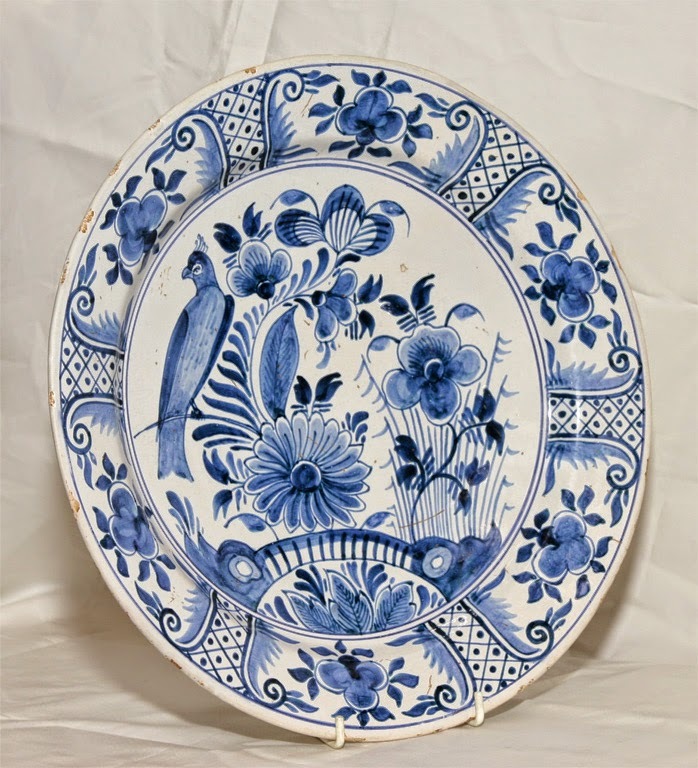 I have designed a decorative central applique plate, surrounded by smaller design plates and centered it all in with piecing that looks to me like much arranged pottery and china. You can see what I mean about the variations in blue. From mid tone to dark. Personally, I've noticed that blue and white quilts don't photograph terribly well - unless under the right lighting conditions. I have found this to be true for red and white quilts as well. It's just one of those things. and the colour I choose will be based on the decor of my home as this quilt will hang. I have a very bright room which I am thinking about painting in either warm earthy tones or cream - two very different styles. I will let my furnishings and colour scheme decide when I get to that point. After all, I like my quilts on my walls and this means I have a whole room to think about. 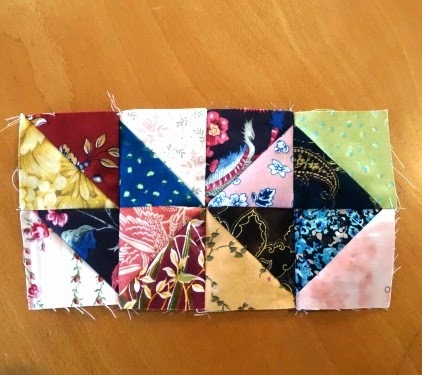 I think this could be a superb scrappy stash busting all blues quilt too...so lets see how I feel about it when I get there. I'm really looking forward to seeing how you use the pattern to suit yourself. 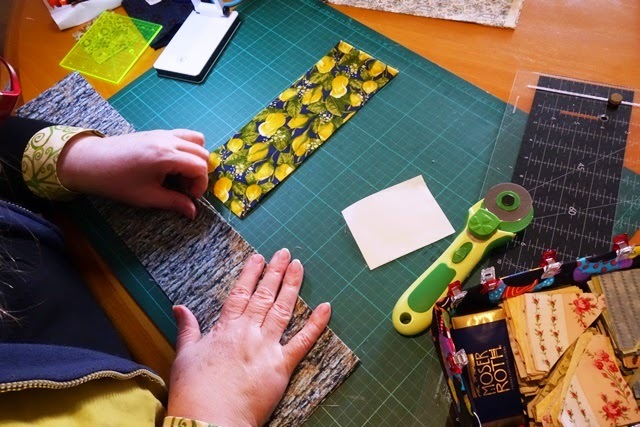 I think that's the best bit about sharing my quilting folio with my blog readers - I get to see so many of my quilts made up in different styles and colours - something I don't have enough lifetimes to do myself. 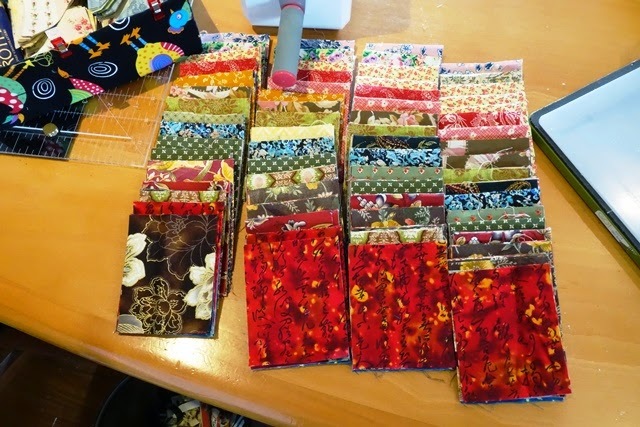 I actually thought this would be the easy bit, but its proving just as difficult to arrange my patchy HSTs as arranging any scheme of fabrics always is for me. I think I'll have to pin them to a wall and get a visual on it, although its so much work and I was hoping to sort it out faster than that. 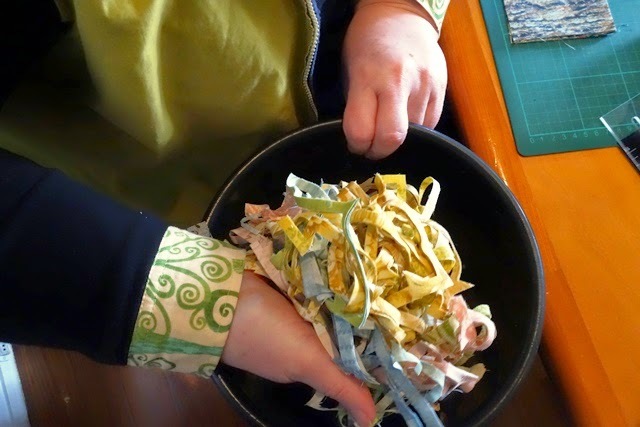 I've cut some strips from assorted fabrics that I've decided to use for Lily Rose. I'm going for a patchy look. 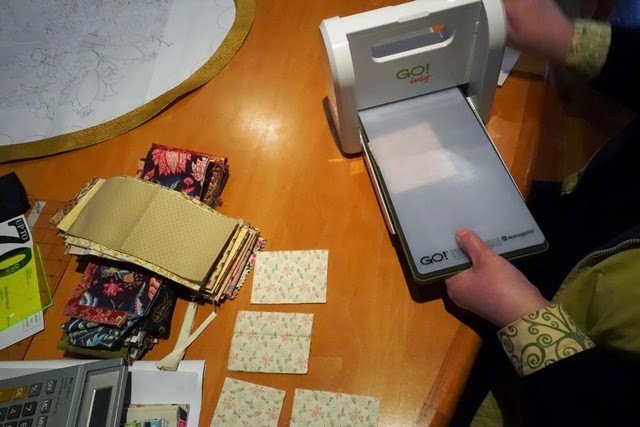 Although I now think it would be faster for me to have rotary cut my strips in HSTs, I pulled out my GO Baby to have a play with it. When selecting my fabrics, I tried to go for an assortment that graduated in light to dark intensity. However, it now appears to me that I am 'mid tone' blind. I always return to selecting mid tone in colour schemes. I don't mind it, I just think it's a curiosity that keeps appearing throughout my quilts and this one is no different. I actually really like my GO Baby cutter and would use it more if I had more dies. The reason I don't is because the shipping from the US to Australia is usually more than the price of the dies themselves. The actual dies are fairly reasonably priced and if I could get free shipping all the way down under, I certainly would use this machine more. There are dies sold closer to home, but they are marked up too high for me to want to support such disparity between pricing. 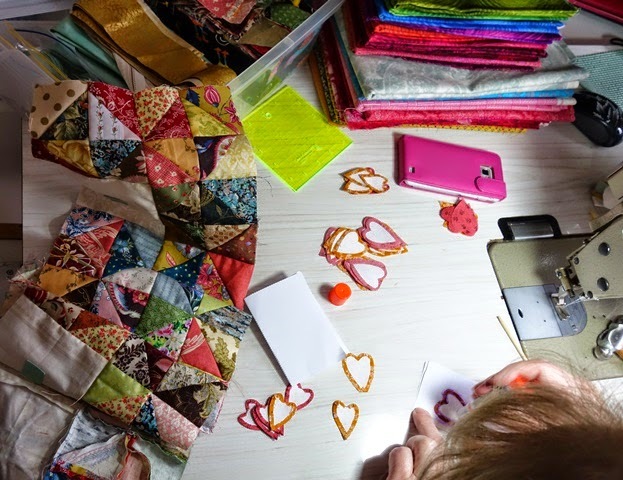 This is one of those realities quilters in Australia have to face a lot - many great products simply cost so much to get. However one thing to be said for it is that it does use a lot of fabric. I think the wastage is huge. That said. I have a lot of fabric in my stash and I really don't care if I use a lot of it up in this way. There's so much I have had to get rid of some already, so wasteful stash busting doesn't concern me. 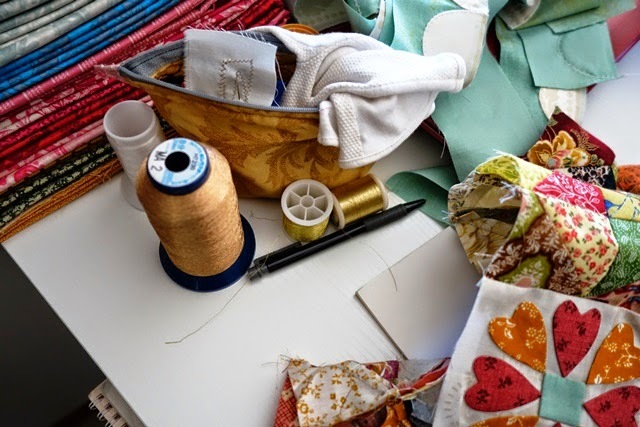 You might feel differently if using designer fabrics or starting out with a new stash. On the fabric scraps that I don't have enough of, I do cut these by hand as I want as many repetitions from them as possible. The funny thing is, as I get up and close to these fabrics, I fall in love with them all over again. After folding and refolding fabrics over and over in the meterage, I think they're even nicer in small doses! Now I just have to arrange their position on the quilt. Its early morning when I take these images, apologies for the light quality. Today I'm working on the oval frame. I selected a gold fabric for my frame as I am after an antique patchy look. This is a fabric from my stash, its a few years old now but I always knew it would come in useful for something. I'm really pleased I didn't throw it out of my stash during my latest clear out in December. As you can see, I have created an oval frame from my template. Here I have selected my fabric. It's really important that your template is accurate, you don't want to have your oval cut at the wrong size. 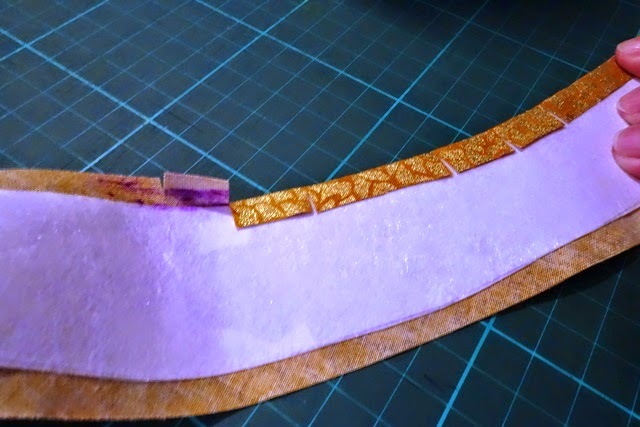 I'm actually gluing my template down onto the fabric to prevent warping. I only use Elmer's disappearing purple glue for this as its not a true 'glue' but rather a starch which makes it suitable for this purpose. You can also pin the template down accurately if you don't have the Elmer's. I made my oval 'template' from Stitch n Wash fusible (that I had stuck together to create a big sheet before cutting out the oval template). 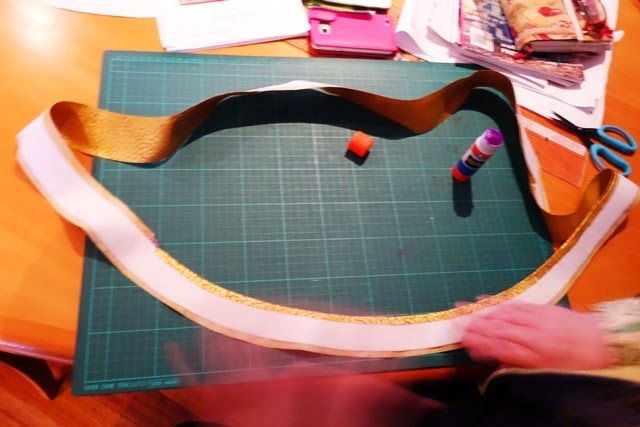 This allows me to turn the edges of my seams and go ahead later and add batting (optional) without having the remove the template. I did this for ease and stability. And also, I happen to have a lot of fusible at the moment. 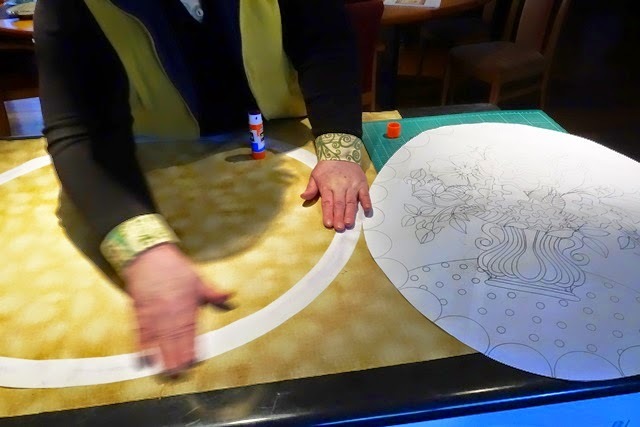 If you made your template from paper, you would remove it now, and turn your edges over carefully according to the crease lines made by the paper when it was in position. 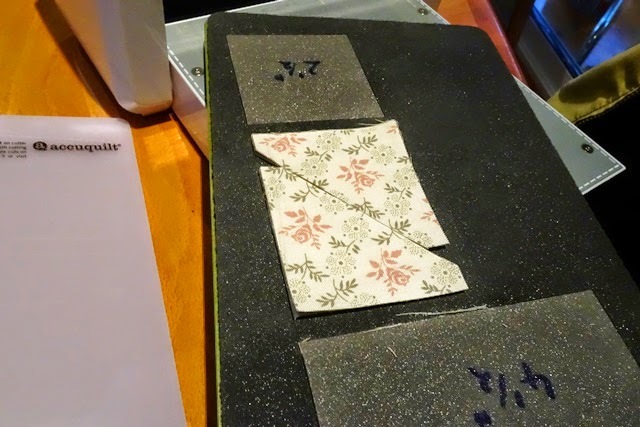 This is another reason I can't recommend any other glue than Elmer's, because with the Elmer's, your paper template (if that is what you used) will release easily and won't skew your fabric or shape at this stage. With the fusible down, I don't need to remove it and this is what you see here. So I clip all the way around the oval carefully and not too deep. 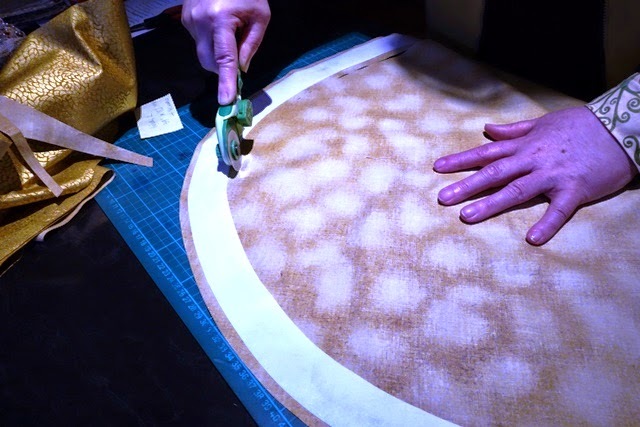 This allows me to turn the fabric without any buckling or creasing or ripples. Clip and turn all the way around. Your oval should be smooth with no bubbles of other turn indications on the front. When you place it over your paper pattern, it should fit perfectly. It's time for me to make breakfast now - is a quilter's work never done? 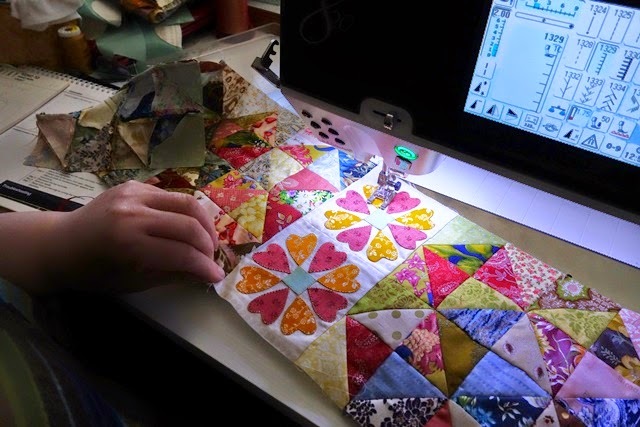 ?- and then I'll be returning to take take over the table once again and make my patchwork HST blocks.